Dam ( Mother) Star-Keeper Perfect to pet all day. Hello ! My Name Is Yukon ! Packed full of personality ! diet, exercise socialization and veterinary care. Meet Yukon, He is raised in a home of love !'' He will fit right in with your family. Can't wait to jump into your arms ! He has those striking bi-color eyes like his Father ( DJ ) and the most stunning beautiful thick coat like his Mother ( Star-Keeper )! . Yukon will be trained to walk on his harness without any pulling. He loves to go on his walks and meet everyone on his way. ready to love you always and unconditionally. How To Reserve Your Puppy. 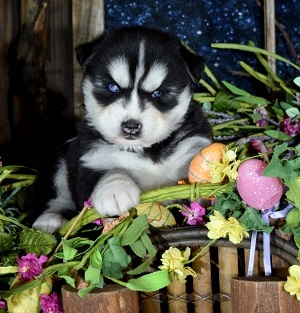 You will need to add Yukon to the cart and put a $200.00 holding fee on her. This will secure her for pick up or shipping. may have, and help you determine if Yukon is right for you. Hello ! My Name Is Yukon !
" 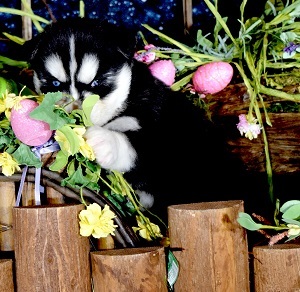 BREEDER" (Loyal Siberian Husky ) has done everything possible to produce healthy sound puppies by raising the puppies in the best way possible in regards to diet, exercise, socialization and veterinary care. You need to schedule a 3 day prior to pick up your puppy, The reason for this is so your puppy will be vet checked and get a cleared health certificate provided by Veterinain Dr.Brooks, It is important that we make sure you're getting a happy, healthy puppy. Comes pre-spoiled with love, sharing smiles. hello hugs and good night kisses. Is the most prestigious and recognized registration organizations in America. Anywhere within the continental United States. Cost is subject to change by airlines price increase. This includes the airfare, required vet checked, certificate of health, travel crate. Want a faster flight you will have to use Dash which is a extra cost. We will make flight arrangements for the airlines. Puppy has to be 8 weeks or older before we will ship your puppy. breeders such as ourselves, don't always live nearby. and distance. Flights are booked in advance with arrival time and confirmation number. Suggested check list for when you go to the airport to pick up your puppy. I will come out of there ready to play.